A.L.C. 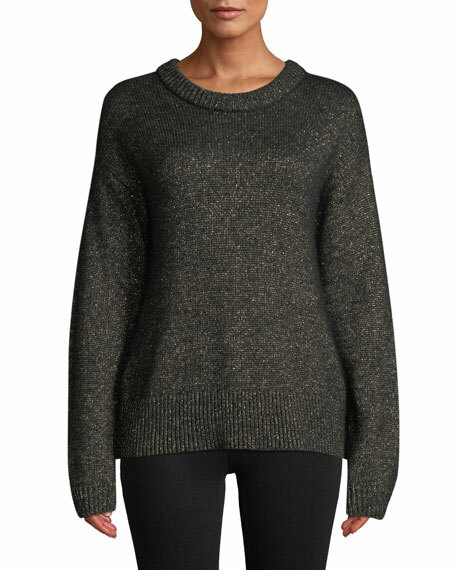 "Bowen" sweater with metallic finish. Ribbed neck, cuffs, and hem. Crew neckline. Long sleeves. Relaxed fit. Cutaway detail at back. Pullover style. Baby alpaca/merino wool/nylon/metallic. Dry clean. Imported. 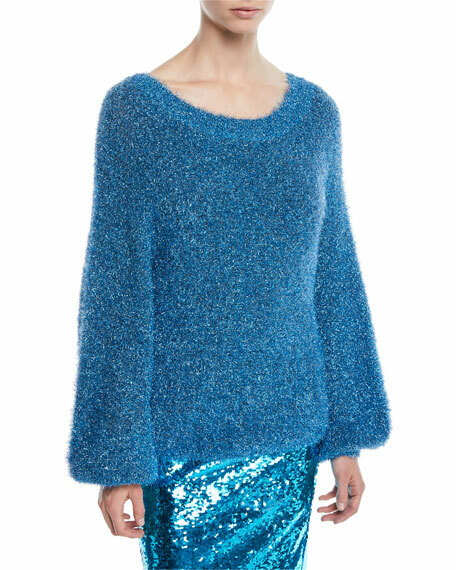 Alice + Olivia "Lisha" sweater. Boat neckline. Long blouson, cuffed sleeves. Relaxed fit. Pullover style. Nylon/metallic fiber. Lining, polyester/spandex. Imported. 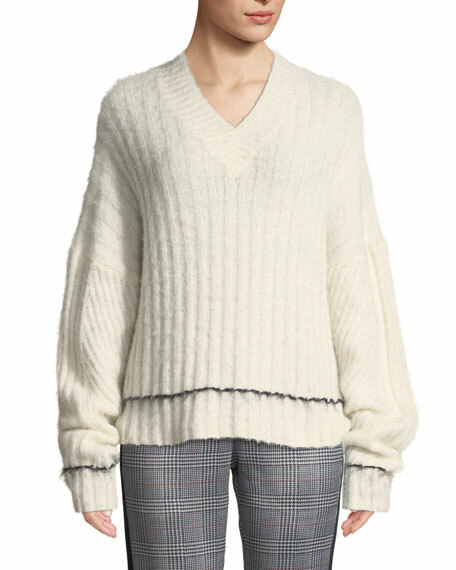 Elie Tahari "Madeline" ribbed sweater with surplus front. 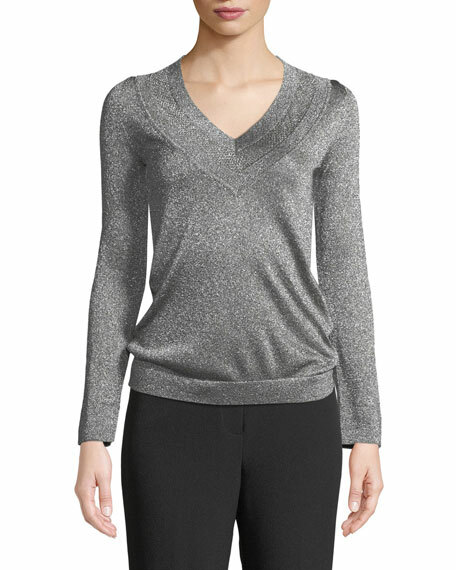 Wrapped V neckline. Long sleeves; textured cuffs. Fitted silhouette. Straight hem. Pullover style. Viscose/polyester. Dry clean. Imported. 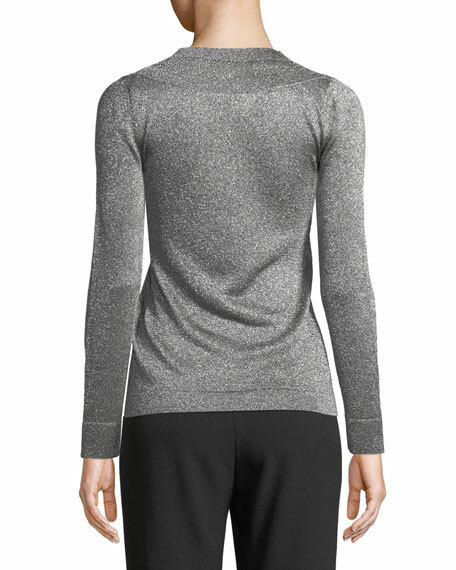 Helmut Lang ribbed sweater in brushed wool-alpaca blend. Contrast stripe at hem and cuffs. V neckline. Long sleeves. Relaxed fit. Pullover style. Wool/alpaca/nylon. Dry clean. Imported.